This article is about the general concept. For the legal concept, see Treasure trove. For other uses, see Treasure (disambiguation). Treasure of Villena, the second most important prehistoric golden tableware finding in Europe. Treasure (from Greek θησαυρός - thēsauros, meaning "treasure store", romanized as thesaurus) is a concentration of riches, often those that originate from ancient history, considered lost and/or forgotten until being rediscovered. Some jurisdictions legally define what constitutes treasure, such as in the British Treasure Act 1996. Howard Pyle illustration of pirates burying treasure, from Howard Pyle's Book of Pirates. A treasure map is a variation of a map to mark the location of buried treasure, a lost mine, a valuable secret or a hidden location. More common in fiction than in reality, "pirate treasure maps" are often depicted in works of fiction as hand drawn and containing arcane clues for the characters to follow. Regardless of the term's literary use, anything that meets the criterion of a "map" that describes the location of a "treasure" could appropriately be called a "treasure map." Thus far, no item mentioned in the scroll has been found. Scholars remain divided on whether the copper scroll represents real burials, and, if so, the total measurements and the owners. Although buried pirate treasure is a favorite literary theme, there are very few documented cases of pirates actually burying treasure, and no documented cases of a historical pirate treasure map. One documented case of buried treasure involved Francis Drake who buried Spanish gold and silver after raiding the train at Nombre de Dios—after Drake went to find his ships, he returned six hours later and retrieved the loot and sailed for England. Drake did not create a map. Another case in 1720 involved British Captain Stratton of the Prince Eugene who, after supposedly trading rum with pirates in the Caribbean, buried his gold near the mouth of the Chesapeake Bay. One of his crew, Morgan Miles, turned him in to the authorities, and it is assumed the loot was recovered. In any case, Captain Stratton was not a pirate, and made no map. The pirate most responsible for the legends of buried pirate treasure was Captain Kidd. The story was that Kidd buried treasure from the plundered ship the Quedah Merchant on Gardiners Island, near Long Island, New York, before being arrested and returned to England, where he was put through a very public trial and executed. Although much of Kidd's treasure was recovered from various people who had taken possession of it before Kidd's arrest (such as his wife and various others who were given it for safe keeping), there was so much public interest and fascination with the case at the time, speculation grew that a vast fortune remained and that Kidd had secretly buried it. 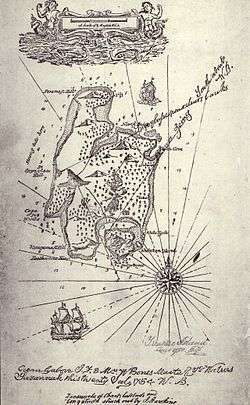 Captain Kidd did bury a small cache of treasure on Gardiner's Island in a spot known as Cherry Tree Field; however, it was removed by Governor Bellomont and sent to England to be used as evidence against him. Over the years many people have tried to find the supposed remnants of Kidd's treasure on Gardiner's Island and elsewhere, but none has ever been found. People have claimed to have discovered maps and other clues that led to pirate treasure, or claim that historical maps are actually treasure maps. These claims are not supported by scholars. Treasure maps have taken on numerous permutations in literature and film, such as the stereotypical tattered chart with an oversized "X" (as in "X marks the spot") to denote the treasure's location, first made popular by Robert Louis Stevenson in Treasure Island (1883), a cryptic puzzle (in Edgar Allan Poe's "The Gold-Bug" (1843)), or a tattoo as seen in the video game The Space Adventure - Cobra: The Legendary Bandit (1991) and the film Waterworld (1995). To illustrate, at various points in the story, how far the quest has progressed. While Robert Louis Stevenson is associated with popularizing the treasure map—and the archetypal X to mark the spot—with pirates in Treasure Island, he is not the first. Author James Fenimore Cooper's earlier 1849 novel The Sea Lions, is a tale that begins with the death of a sailor who has left behind "two old, dirty and ragged charts" which lead to a seal-hunting paradise in the Antarctic as well as a location in the West Indies where pirates have buried treasure, a plot similar to Stevenson's tale. In the 1985 film The Goonies, an old treasure map leads to the secret stash of a legendary 17th-century pirate, an almost exact imitation of Stevenson's plot in Treasure Island. In the 2004 film National Treasure, a treasure map becomes the source of the quest itself. In the 1994 comedy City Slickers II: The Legend of Curly's Gold, a treasure map is made by criminals who are analogous to modern day pirates. In the film Waterworld, an extremely vague and cryptic treasure map has been tattooed on the back of the child character Enola. This map leads the characters to dry-land, which in the context of the film, is a treasure. In 2003, the Drake Tribe found buried pirates treasure in Survivor: Pearl Islands. Spanish treasure lost from the Spanish treasure fleet consisted of gold, silver, jewels (especially emeralds) and also cocoa, vanilla and brazilwood. ↑ García Martínez, Florentino and Eibert J. C. Tigchelaar, The Dead Sea Scrolls: Study Edition, Paperback ed. 2 vols., (Leiden and Grand Rapids: Brill and Eerdmans, 2000). 1 2 3 4 5 Cordingly, David. (1995). Under the Black Flag: The Romance and the Reality of Life Among the Pirates. ISBN 0-679-42560-8.